Table 3.5. Molecular and biochemical properties of free «-amino acid transport proteins8. aDoes not include members of the BGT, GAT, GLYT, TAUT or PRO neurotransmitter transporter families. b';' denotes physiologically significant differences in degree of substrate affinity. cCssC, l-cystine; Orn, ornithine; MeAIB, 2-methylaminoisobutyrate; AIB, a-aminoisobutyric acid; BCH, 2-aminobiyclo(2,2,1)heptane-2-carboxylic acid; Dopa, l-dihydroxyphenylalanine. dWhen possible, values are data from overexpression of cDN A by mammalian cells, rather than by Xenopus oocytes. eMember of the glycoprotein-associated amino acid transporter family. 'Associates with 4F2hc glycoprotein. Associates with rBAT glycoprotein. Table 3.6. Expression of free «-amino acid transporter activities, mRNA and/or protein by mammalian gastrointestinal epithelia. aAs reviewed by Ganapathy etal. (1994), Mailliard etal. (1995), Palacin etal. (1998), Wagner etal. (2001), Bode (2001) and/or Matthews and Anderson (2002). Ap, apical; Bl, basolateral membrane; NR, not reported. bR, rumen; O, omasum; D, duodenum; J, jejunum; I, ileum; Co, colon; Ce, caecum. cWhen known, expression is reported for farm animal species. dCMV, crude membrane vesicles isolated from homogenates of scraped epithelial tissues. limited mRNA tissue distribution profiles for ATB°-+, which encodes a protein capable of B°-+ activity, show« no expression by the duodenum or jejunum and only weak expression by the distal ileum. In contrast, caecal and colonic expression is high. 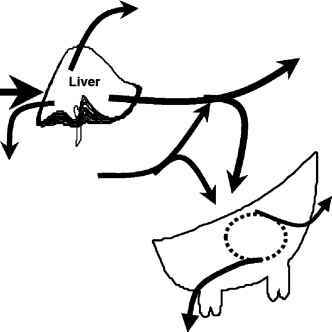 Therefore, it remains to be determined whether ATB°-+ function contributes significantly to small intestinal absorption of amino acids, or whether another, as yet unidentified, ATB°-+ isoform is responsible for system B°-+ activity. In terms of basolateral transport capacity, cationic amino acids are unilaterally transported by CAT1 uniport in counterexchange for neutral amino acids by y+LATl. In addition, given its intracellular binding preference for l-arginine and the high blood concentrations of l-glutamine, the predominant function of y+LAT2 is to absorb l-glutamine into enter ocytes in exchange for l-arginine. Accordingly, the function of y+LAT2 may well be the mechanical coupling of the high intestinal l-glutamine uptake from, and l-arginine export into, splanchnic blood (Wu, 1998). In contrast, the presence of a basolateral anionic amino acid transporter has yet to be described (although xCT mRNA has been detected by RT-PCR, Bassi et ai, 2001), and may help explain the low arterial uptake of l-glutamate and l-aspartate by small intestinal epithelia. Neutral amino acid transport across the basolateral membrane of enterocytes appears to be achieved by a combination of activities by Na+-dependent (ATA2) and Na+-independent (TAT1) uniporters and ion-independent amino acid exchangers (Asc-1, LAT2, y+LATl, y+LAT2). In addition, SN2 may contribute significantly to l-histidine, l-serine, l-asparagine and L-glutamine absorption by coupled Na+/H+ counter-exchange (Bode, 2001). In terms of how amino acid flux is mediated across enterocytes, all of the apical transporters are ion-dependent and capable of concentrative transport, except for the two system b0,+ transporters. Consequently, the molar ratio of cationic and neutral amino acids initially absorbed from the lumen by concentrative transporters can be modulated by ATBa+ activity. 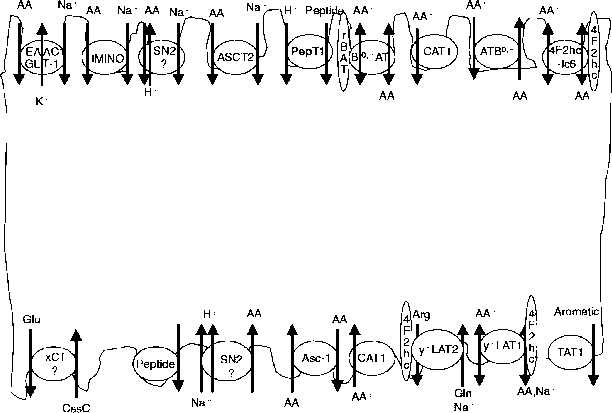 Of the basolateral transporters, only ATA2 and TAT1 are uniporters. ATA2 (system A activity) activity is Na+-dependent, capable of concentrative transport, and functions to transport amino acids into the cell, not into the blood. Conversely, TAT1 is a Na+-independent system that selectively transports aromatic amino acids, down their concentration gradients. In contrast the other basolateral transporters are all exchangers. As a consequence of this differential expression of apical and basolateral transporters, it is likely that the bulk of amino acids that enter the blood through enterocytes is dependent on the concentration of amino acids in the cytosol of enterocytes. Fig. 3.2. Working model for the membrane-specific expression of peptide and free amino acid transporters by intestinal epithelial cells. The locations and predominant direction of substrate flow is derived from functional properties listed in Tables 3.4 and 3.5, and/or described in the text. has not been evaluated, the influence of api-cally expressed PepTl function on apical neutral and cationic amino acid uptake capacity by polarized Caco-2 cells has been (Wenzel et al., 2001). PepTl uptake of several neutral amino acid-containing dipeptides resulted in a 2.5- to 3.5-fold increased uptake of l-arginine by apical ba+AT activity. As this stimulation was dependent on intracellular hydrolysis of transported amino acids, it appears that PepTl activity stimulated l-arginine by supplying requisite amino acids to drive b°-+AT antiport uptake of arginine.